There are certain aspects of beer gardens that many of us take for granted, for those with children, the most important part of a beer gardens makeup and layout is that it will contain their children while they can sit and enjoy a drink. Beer gardens can, in that sense, be something of a saviour for parents in that their children can to some extent be left to their own devices. This is not to say that all beer gardens have to be this way, but the premier, champion, top dollar beer gardens probably will. So on top of that we’ve settled that beer gardens can come in many shapes and sizes, and we’ve also settled that they must be attached to a public establishment, and that they actually originated in Germany. With all this in mind we can get on with telling you our list of seven beer gardens in Lambeth borough that you have to try this summer. The garden at 19 Streatham is not a traditional garden in the sense that this is a cocktail bar and restaurant – rather than a pub. However, as shown in other lists, we don’t discriminate as to what kind of establishments can have a beer garden. Café, pub, cocktail bar or restaurant, it’s fine. Plus, 19 Streatham’s garden is special because it’s secret. Really, we shouldn’t be telling you about it, but we trust you so it’s okay. Just promise you won’t tell anyone else. Also, don’t forget to bring your South London Club card so you can get 10% off on food and drink. We’ve said it before and we’ll say it again, we love independents and will do our utmost to support them. 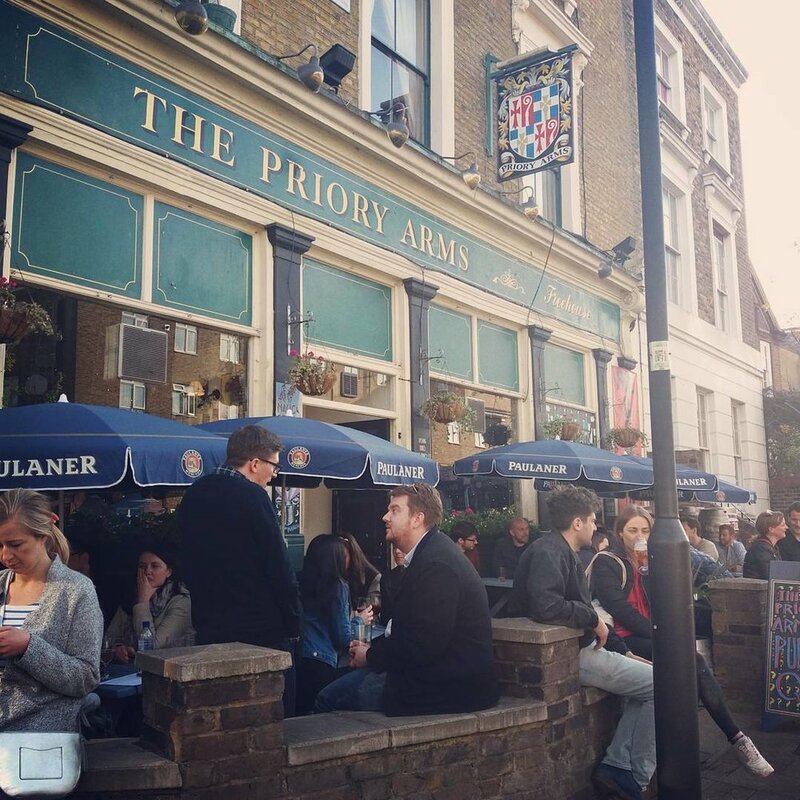 The Priory Arms is a very handsome independent that we can really get on board with. The beer garden is a front patio with ample opportunity for people watching, and this is made all the better by the absolutely fabulous beer selection. A beer garden can be great but if all you’ve got to drink in it is rubbish – we’re not naming any names – then you’re not gonna want to be there long. With about 40 German and Belgian bottled beers on offer, this is certainly not a problem at the Priory Arms. We think Streatham is a great area of Lambeth that doesn’t get the praise it deserves, so we’ve decided to include two beer gardens in the area on our list. The Manor Arms has a lot of things going for it, great good, great choice of drinks, and a very attractive garden to enjoy either food or drink, heck, you might even enjoy both you crazy cats. It should be said that the interior of the pub is also very attractive, and you might be so taken that you stay inside, but we can promise that the tastefully arranged garden is certainly worth a visit. You could make that visit even better by bringing your South London Club card and getting 20% off on food! We briefly looked into finding out the reason behind the Stonhouse’s curious name, but were thwarted. We like to think that they wanted to call it the Stonehouse but the person painting the name made a spelling mistake and they went with it. Really, however, its name isn’t all that important. What is important is that their beer garden is a fantastic south-facing suntrap that is nicely tucked away off Clapham High Street. With wonderful food, and very reliable service, this beer garden, and the pub in general for that matter, does everything you expect and more. Right on the dangerous border of Lambeth and Southwark, Grand Union Kennington gets on this list because of its great roof terrace. Quite literally round the corner from the Imperial War Museum, the roof terrace at the Grand Union Kennington does not do things in half measures. With a 100 person capacity and great views of landmarks like the London Eye, it provides the perfect setting to enjoy a simple ‘adult drink’ like a beer or maybe even a more complicated ‘adult drink’ like a cocktail. How about you make that roof terrace even better by showing your South London Club card at the bar and getting 10% off. Go on, you know you want to. Named after the underground River Effra, the Effra Hall is a very popular independent in Brixton. 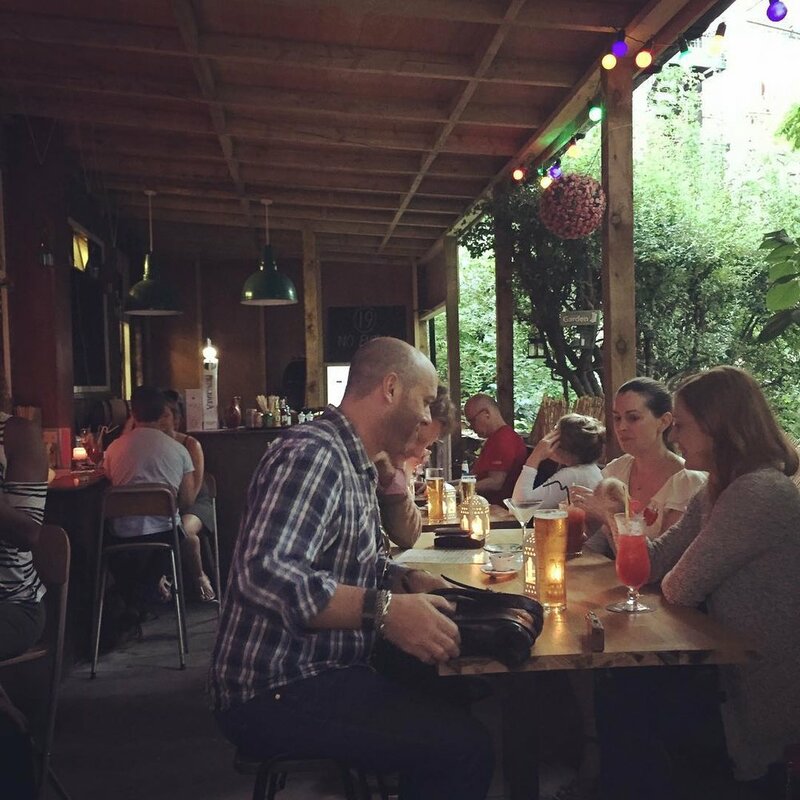 Serving a really great Caribbean-inspired menu in a very tidy beer garden, this pub has one feature that we really, really love at South London Club. A pub cat. Now we know that there are many dog lovers out there, and we appreciate that a pub cat simply doesn’t work if a pub is dog-friendly, but the Effra Hall is one of those inner-city pubs that has a pub cat, and we can see nothing wrong with that. If you haven’t met a pub cat yet they are essentially the best hosts in the world, they are anyone and everyone’s mate. The Effra Hall has a particularly good pub cat who likes sitting on the high walls surveying all the drinkers, whether they own it or not is another matter. For the sake of including as many different establishments as possible we’ve decided to include the Bullfinch Brewery tapyard. The layout of breweries like the Bullfinch Brewery means that hosting a beer garden out the front of the brewery is a no-brainer, it’s a simple matter of opening the door and sticking out some tables. We’re also a big fan of supporting small breweries, and what better way to do that then purchasing their produce straight from them. The atmosphere out front is really relaxed and this is a great option for enjoying a carefully brewed beverage during a sunny weekend.